We hiked along the trail leading downwards into the monument-just for a short distance on this hot, September afternoon. I found a big boulder to put picaassocam on for this exposure. Boulders and hoodoos tower overhead while on the trail. They seem so precariously-perched and yet stable at the same time. 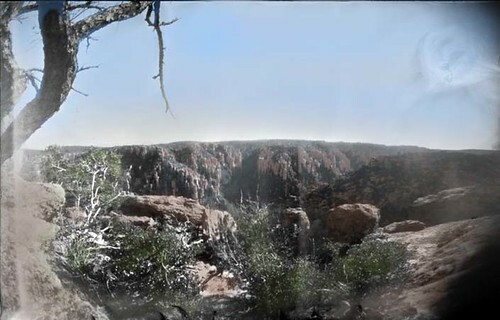 I added color in Photoshop in hopes to increase the visibility of the rock formations across the canyon.